Teaching technology at Meyer Elementary School goes beyond showing kids how to use apps. It gives students a context for learning technology through subject areas, making all learning more relevant. In this video, see some cool ways to incorporate green screen in conjunction with one-to-one for more engaged learning. How do you use tablets in class? KQED's Mind/Shift recent blog explored how different teachers and their classes used tablets in these one-to-one classes. The Chicago 5th graders studied were from a school where over 90% of student receive free or reduced lunch. The table below - with my highlighting added - shows how different students used the tablets over the course of the year. Students were allowed to take tablets home even though only 39% had Wifi access. Research increased for all as a natural function of having the tablets. However, three important instructional practices - creating videos, class polling and taking notes - varied significantly. Why use Tablets in Class? Is one-to-one worth it? Tablets have become more than a fad at this point. Here are 21 reasons to use tablets in the 21st century. Awesome Links by Mr. Graves: Compiled by a 6th grade computer teacher in Las Vegas, it is a place to find great tools. It also demonstrates the power of collaboration. 21 Things 4 Students: Free, fun, engaging. Includes a multitude of project-based units with a wide range of apps. Watch the 3 min. intro video. GCF LearnFree: Learn and become competent using free quality curriculum for MS Office 2010 programs. Includes great lessons with supplementary videos. 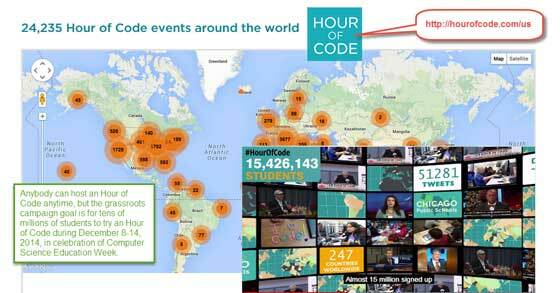 Khan Academy: Use Hour of Code in your classroom. Writing is more than a solitary activity. It benefits from collaboration. Google Docs provide that in real time. Docs also provides a window for the teacher into the student thought process. Students learn valuable social skills. Teachers should browse Google's public templates for ideas. Learn to create your own Google Apps Script. It is not as hard as you think, and it may save you time. Check out the tutorial by Google Certified Teacher Alice Keeler. Check out Google Classroom for a learning managment system. You must be a Google Apps For Education (GAFE) user with a school account. Absolutely current. This site is an essential guide for information literacy, what to do, and what not to do. Teachers click here. Sponsored by the National Center for Missing & Exploited Children, this is a lifesaver site. Each subsite is specifically designed for: teens, tweens, kids, parents, and teachers. When you need to use copyright free images, video or music, you are probably using Creative Commons licensing in which licensing rights are given in advance. Learn how to use them. The Internet has everything, but how do you know when it is true? Snopes is a well-regarded and fascinating Internet resource for researching urban legends, myths, and rumors. Free technology, library and information resources. Exceptionally rich online magazine resource. Follow educational trends, project based learning or technology integration. Sponsored by the George Lucas Educational Foundation. A high energy Internet TV show. Creative, innovative, engaging. Sponsored by Computer Using Educators (CUE). How we will learn. Sponsored by PBS station KQED. The following Mind/Shift blogs explore the Someday/Monday dichotomy that teachers face, that is, how does one move from theory (sounds very cool; I'll do it someday) to concrete application (it's time to plan my lesson activity for Monday morning). They developed a compelling model that progresses from consumption of media to curation, creation, and connection. Intel has been sponsoring the development of high quality teaching and learning tools for years. Check out Visual Ranking Tool, Showing Evidence Tool, and Seeing Reason Tool, and the Assessing Projects Tool. The hallmark of modern technology in education may be the ease of interaction and collaboration. There are many tools to accomplish this. Used more and more as a back channel and educational tool. Here are 7 ideas for using Twitter in the classroom. Any Google Doc can be shared with another Google user. (Must have a Gmail account.) Real time collaboration. Have something to say? Start your own blog. All are free although some have "pro" editions. Edublogs is great and targeted to education. You may choose any of a number of themes, classroom tools and more. Watch this video on Why Edublogs. Google provides the free Blogger which is part of GOogle Apps suite. Of course, WordPress is still the standard for many professionals. Some refer to it as a content management system. It is what I use for Rick's Blog. Try either PBWorks or Wikispaces. Here is an education case study. This comprehensive guide produced by Google is primarily designed for IT administrators, but anyone who wants to know more about what goes on under the hood might take a look.